Yesterday was a day for loungewear! I caught a bug from my grandson and it was the first day that I felt well enough to even get dressed. This great loungewear from Target was just the thing to wear around the house because it's comfortable and festive. 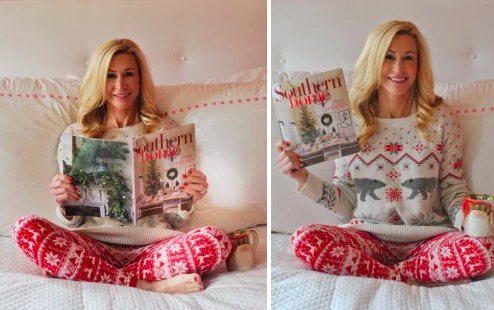 I curled up on the bed with a cup of ginger tea (I always add a little cream and honey) and read my Southern Home Christmas issue from cover to cover. I was recuperating in style! When the holidays are over, I'm going to plan a day to lounge in style when I'm feeling great and just stay in bed and enjoy myself, but for now, it's full steam ahead with holiday errands. Being sick put me seriously behind! I'm off to finish my Christmas shopping today and you might just see me running around town in my loungewear! My mug is from Vietri and is one of my favorite Christmas patterns. The Southern Home Christmas issue is filled with great ideas for your holiday decorating! I feel so inspired looking at the beautiful homes that are featured! I can't believe that Christmas Eve is in one week! I hope everyone has a great weekend and I hope you have a chance to put on your loungewear for a little while and relax! Follow me on Instagram @crazyblondelifeblog as I shop until I drop!